We cooked and photographed this recipe from Lisa Fein's Homesick Texan Cookbook. Assembled like a casserole, stacked enchiladas are much easier to make then the traditional rolled enchiladas. 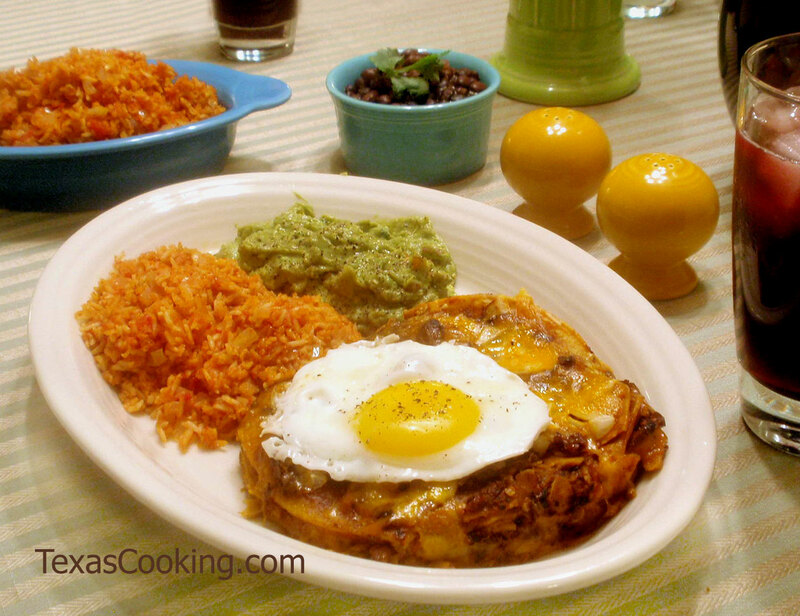 Served with a fried egg on top, these are also referred to as New Mexico Enchiladas. Warm up a cast-iron skillet on high heat. Toast the ancho chiles on each side for about 10 seconds or just until they start to puff. Fill the skillet with enough water to cover chiles. Leave the heat on until water begins to boil and then turn off the heat and let the chiles soak until soft, about 30 minutes. Once hydrated, discard the soaking water and rinse the chiles. Put ancho chiles, chipotle chiles, garlic, half of the diced onions, cumin, oregano, allspice, and chicken broth in a blender and puree. It should be thick and smooth. In a pot, heat 1 tablespoon of lard or oil on low heat and then whisk in the flour. Pour in the sauce, and simmer for 15 minutes, stirring occasionally. Add salt and black pepper to taste and adjust other seasonings as needed. Preheat the oven to 350 degrees and lightly grease a large baking dish. In a skillet, heat on medium 1 tablespoon of lard or oil. Cook each tortilla for about 30 seconds on each side (or until soft). Keep warm in a towel or a warmer. To assemble the enchiladas, take a tortilla and place it in the baking dish. Drizzle 1/4 cup of the sauce on each tortilla and then add 1/4 cup of the grated cheese, mixed and 1 teaspoon of onions. Add another tortilla, and add some amount of sauce, cheese and onions. Add a third tortilla, and again top with sauce, cheese and onions. Repeat until you have four stacks. Bake enchiladas in the oven for 15 minutes or until cheese is melted and bubbling. While enchiladas are cooking, heat the remaining tablespoon of lard or oil in the cast-iron skillet and then fry the eggs two at a time (or however many will fit). To serve, place an enchilada stack on a plate and top with a fried egg. On the side, serve Mexican Red Rice and Refried Beans. Note: A word about chili powder: The most-recommended chili powder in Texas is Gebhardt's, and for good reason. Also, if you make your own chili powder and can get your hands on some dried chiles pasillas, make some pure ground pasillas, and you'll have an extraordinary powder for Tex-Mex enchiladas. However, if neither is accessible, you can still make perfectly acceptable and delicious Tex-Mex enchiladas with McCormick's or Durkee's chili powder, or whatever it is that your store carries. If you know nothing whatsoever of chili powder or chiles, then my instructions to you are very simple: Buy a product called "chili powder" -- not cayenne, not crushed red pepper, not ground red pepper. Also popular - How to Make Corn Tortillas.